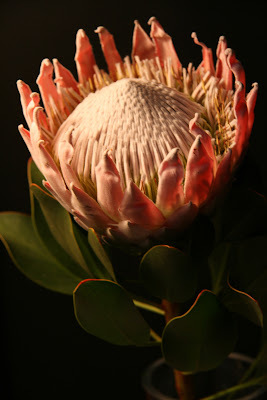 I might marry a man on the spot if he brought me a South African King Protea (Protea cynaroides). He could choose it based on aesthetics, thinking, "Wow, Hollister's one exotic gal and this would look just wonderful against the black wall and next to all her taxidermy," and simultaneously display a coy, cheeky sense of humor. This genus' nicknames: "sugarbush" and "honeypot." Ah, it's a courtship flower afterall. (I've recently been making Saturday trips to Sprout Home on Grand Street in Williamsburg to pick up my naturey tidbits for the week. It's a fantastic shop and I love how they wrap the cut flowers in butcher paper and twine). I married a man who gave me this flower. 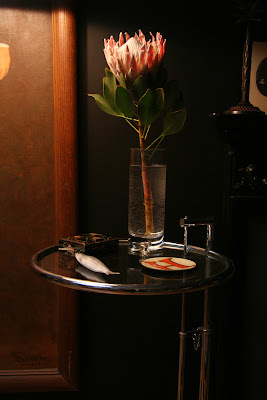 Beautifully set in the most elegant vase a woman could hope for, sexual orientation not considered. Breathtaking. We divorced one year later: he was a hopeless, unrepentant philanderer. I misread the symbolism. He loved honeypots. So deep was this love, any honeypot would do. That's the tricky thing about symbolism. (Did I menion this was during a separation, when he was doing his damned best to woo me back?) Seduce has an illuminating etymology. I would now prefer a man who gave me a dictionary. While tragic, this is the best blog comment I've ever read, let alone received. It seems that the allure of honeypots of all kinds may be a bit too over powering!